Nxled, the leader in next generation lighting, renewed its support for the University of the Philippines Men’s Basketball Team for University Athletics Association of the Philippines (UAAP) Season 81. The lighting and fixtures company designed for longevity and breakage-resistance committed to help UP breed the next generation of champions and be a part of its bright future. 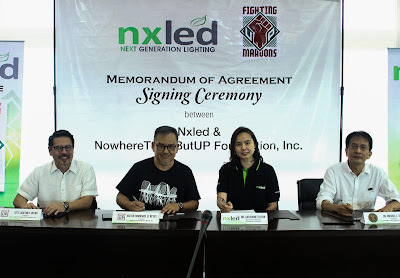 Nxled executive vice president Catherine Tiu-Tan, UP chancellor Michael Tan, and officials of Nowhere To Go But UP Foundation (NTGBUP) -- a volunteer group of UP alumni supporting UP’s varsity programs led by its president, Atty. Agaton Uvero -- officially renewed their partnership by signing a new Memorandum of Agreement (MoA) on Tuesday, July 10 at Quezon Hall of the University of the Philippines Diliman. Also present at the signing ceremony were UP head coach Bo Perasol and his coaching staff, the UP Fighting Maroons and another UP MBT major backer, Ms. Robina Gokongwei-Pe, president, CEO and director of Robinson Retail Holdings, Inc.